We celebrated pongal (the harvest festival) a week back. Leisurely posting the recipe a week later, that is how “fast” I am. Well, next year I can republish this post right on time, so I am happy for next year ;). 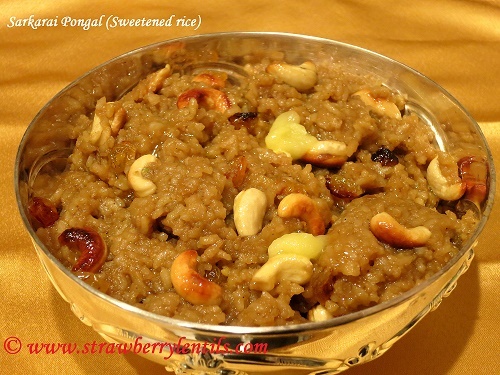 Sarkarai Pongal is a very traditional, very basic and a very simple dessert, often offered in temples or made in homes on auspicious days. But don’t let that restrict you, this makes a great dessert for any day or any party. Another popular variation of this dish is “Akkara Vadisal” where rice is cooked in milk instead of water. Making this sweet pongal involves only four basic steps. 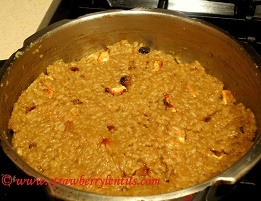 Cook rice, make brown sugar syrup, mix rice and syrup, add some roasted nuts and raisins. Child’s play , right ? It is really that simple. Hopefully, the tips I give below are helpful in simplifying the already simple recipe. First, we have to get the rice ready. In a pan or a pressure cooker, heat 2 tbsp of ghee or butter and roast the moong dal (green gram). 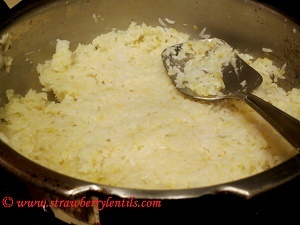 Rinse rice and add rice to the pan and mix well that each grain is coated with ghee. 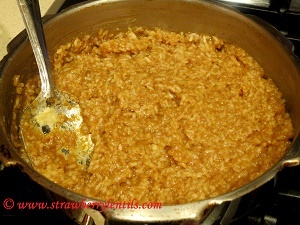 Rice and dal mixture has to be well cooked to really soft consistency, so double up the quantity of water used. 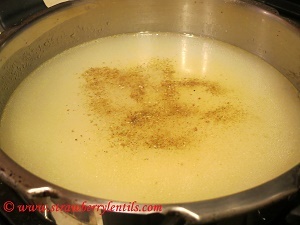 Add 4 cups of water and 2 tsp of cardamom powder and cook the rice and dal until soft. When rice is cooked , mash it gently with the back of a spatula. (If not using pressure cooker, you will have to add more water). 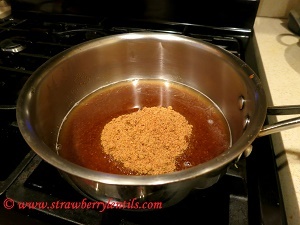 Now to make the brown sugar syrup, mix 1 cup of brown sugar in 1/4 cup of water and heat until the sugar completely dissolves in water. 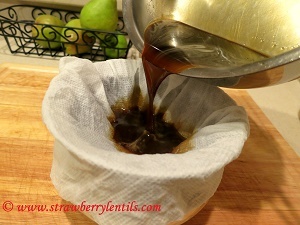 If you are using jaggery/vellam it is important to make sure the syrup is free of any impurities, so filter the sugar solution using a clean cloth. I used a wet bounty paper towel, it gets the job done. 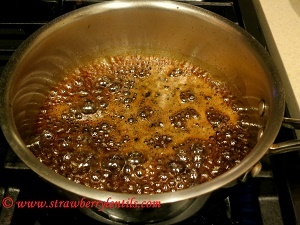 Now, put the clean syrup back on heat and bring it to a boil. 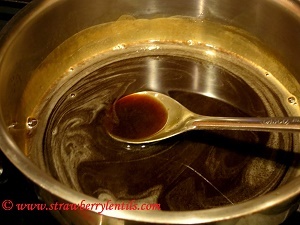 You are looking for 1-string consistency, but when your syrup comes to a good rolling boil, you can be sure its there. 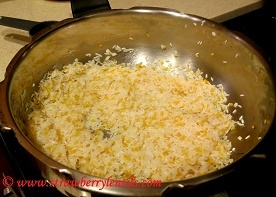 Add the syrup to the cooked rice and dal and mix thoroughly. 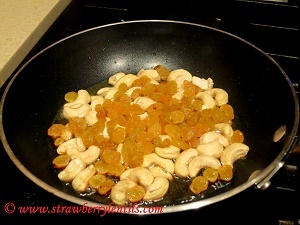 Now , for the last step : In a separate pan , add a tbsp of ghee/butter , and fry the cashews and raisins to golden brown and add to the rice. 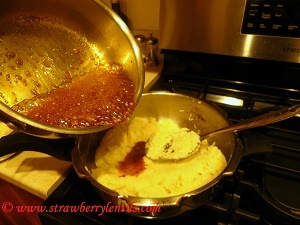 Instead of making syrup, you can directly add the brown sugar to rice. 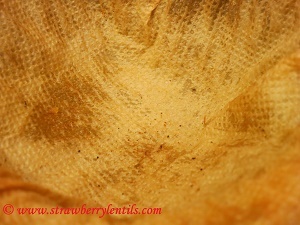 But I do not prefer that method, as the brown sugar tastes raw in the final pongal. Adding the syrup gives a well rounded taste. I have only used cardamom powder, you can also add nutmeg, ground cinnamom or a pinch of ground ginger to elevate the flavors. It is not very appealing when it is in a soupy consistency, often confusing the eater if its pongal or payasam (kheer). It should be in the”sticky rice” consistency. Use milk to cook the rice instead of water and make a much creamier version of this pongal, which is also called as “Akkara Vadisal”. Treat yourself to this yumminess effortless !!!!! !